1. Integrity, transparency and ethical standards. 2. Customer care -understanding and responding to all our customers´requirements and necessities. We are constantly working hardly to build lasting and close relationships with our clients, partners and cooperators, as everyone involved in operations and businesses with us is printed with our philosophy of loyalty, respect and mutual benefit. 3. Respect for the individual and diversity as a key asset in achieving our ultimate goals. 4. Team and cooperative work. Just encouraging open wide communication across the organization, sharing best practices, knowledge and technology we will reach our objectives. 5. Responsibility and accountability. Throughout definition of responsibility and accountability we can empower our employees, partners and operators for their individual contributions and ultimately the success of the entire company and organization. 6. Innovation, creativity and development. Being energetic, proactive, creative and passionate about everything we do, is that we are reaching our goals. 7. Continuously innovation, support and encourage of creative and new ideas as well as providing opportunities for individual development. The ND Pharma & Biotech Code of Conduct sets out the values, principles and practices that guide business conduct in ND Pharma & Biotech, it´s subsidiaries and associates.It describes and reinforces company-wide ethical standards and sustains a work environment that fosters integrity, respect and fairness. This Code applies to officers, directors and employees worldwide as well as to members of the Board. This Code of Business Conduct and Ethics ("Code") contains general guidelines for conducting the business of the Company consistent with the highest standards of business ethics, and is intended to qualify as a "code of ethics" within the meaning of Section 406 of the Sarbanes-Oxley Act of 2002 and the rules promulgated thereunder. This Code applies to all of our directors, officers, employees, consultants and agents, wherever they are located and whether they work for the Company on a full or part-time basis. We refer to all persons covered by this Code as "Company employees" or simply "employees." We also refer to our Chief Executive Officer ("CEO") and our Chief Financial Officer ("CFO") as our "principal officers." How does this make me feel about myself and the Company? Would I feel comfortable if an account of my actions was published with my name in the newspaper? If you still feel uncomfortable about a situation or have any doubts about whether it is consistent with the Company's high ethical standards, seek help. We encourage you to contact your supervisor for help first. If your supervisor cannot answer your question or if you do not feel comfortable contacting your supervisor, contact the CEO. All employees have a duty to report any known or suspected violation of this Code, including any violation of laws, rules, regulations or policies that apply to the Company. Reporting a known or suspected violation of this Code by others should not be considered an act of disloyalty, but an action to safeguard the reputation and integrity of the Company and its employees. If you know of or suspect a violation of this Code, immediately report the conduct to your supervisor. Your supervisor will contact the CEO, which will work with you and your supervisor to investigate your concern. If you do not feel comfortable reporting the conduct to your supervisor or you do not get a satisfactory response, you may contact the CEO directly. The CEO will work directly with you to investigate your concern. It is the Company's policy that any employee who violates this Code will be subject to appropriate discipline, including potential termination of employment, determined by the CEO based upon the facts and circumstances of each particular situation. An employee accused of violating this Code will be given an opportunity to present his or her version of the events at issue to the CEO prior to any determination of appropriate discipline. Any employee who fails to report known or suspected violations by another employee may also be subject to appropriate discipline. Furthermore, employees who violate the law or this Code may expose themselves to substantial civil damages, criminal fines and prison terms. The Company may also face substantial fines and penalties in such situations, not to mention damage to the Company's reputation and standing in the community. In short, your conduct as an employee of the Company, if it does not comply with the law or with this Code, can result in serious consequences for both you and the Company. All questions and reports of known or suspected violations of the law or this Code will be treated with sensitivity and discretion. Your supervisor, the CEO and the Company will protect your confidentiality to the extent possible consistent with law and the Company's need to investigate your concern. The Company strictly prohibits retaliation against an employee who, in good faith, seeks help or reports known or suspected violations. Any reprisal or retaliation against an employee because the employee, in good faith, sought help or filed a report will be subject to disciplinary action, including potential termination of employment. Waivers of this Code will be granted on a case-by-case basis and only in extraordinary circumstances. Waivers of this Code for employees may be made only by CEO of the Company. Any waiver of this Code for our directors, executive officers or other principal officers may be made only by our Board of Directors or the appropriate committee of our Board of Directors and will be promptly disclosed to the public. All employees are expected to devote 100% of their working time, effort, and abilities to the performance of their duties for ND Pharma & Biotech. Moreover, employees are expected to dedicate their undivided loyalty to the Company, to represent the Company in a positive and ethical manner, and to avoid any situation that may create an actual or potential conflict of interest. A conflict of interest exists when an employee's loyalties are divided between either (1) the employee's personal interests and the Company's interests, or (2) the Company's interests and those of another, such as a customer, supplier, contractor, or competitor. While it is not feasible to describe all possible conflicts of interest that may arise, some of the more common conflicts that employees must avoid include the following. Obtain loans or guarantees of personal obligations from, or enter into any other personal financial transaction with, any company that is a material customer, supplier or competitor of the Company. This guideline does not prohibit arms-length transactions with recognized banks or other financial institutions. Serve on a board of directors or trustees or on a committee of any entity (whether profit or not-for profit) whose interests reasonably could be expected to conflict with those of the Company. Employees must obtain prior approval from the CEO before accepting any such board or committee position. The Company may revisit its approval of any such position at any time to determine whether service in such position is still appropriate. Develop a personal relationship with a subordinate employee of the Company or with an employee of a competitor, supplier, contractor, or customer that might interfere with the exercise of the impartial judgment in decisions affecting the Company or any employees of the Company. Obtain improper personal benefits or favors because of his or her position with the Company. The actions of family members outside the workplace may also give rise to conflicts of interest because they may influence an employee's objectivity in making decisions on behalf of the Company. For example, it is a conflict of interest if a family member is employed by, or has a significant financial interest in, a company that is a material customer, supplier or competitor of the Company. It is also a conflict of interest if a family member obtains loans or guarantees of personal obligations from, or enters into any other personal financial transaction with, any company that is a material customer, supplier or competitor of the Company. Similarly, receipt of improper personal benefits or favors by family members creates a conflict of interest. Employees should report to a supervisor any situation involving family members that reasonably could be expected to give rise to a conflict of interest. Your supervisor will contact the CEO to discuss appropriate measures, if any, that should be taken to mitigate the potential conflict of interest. If a member of your family is an employee of, or has a significant financial interest in, a company that is a material customer, supplier or competitor of the Company, you will be prohibited from participating in business decisions with respect to such company. It is also inappropriate for you to discuss the Company's confidential information with members of your family that have such conflicting interests. For purposes of this Code, "family members" or "members of your family" include your spouse or life-partner, brothers, sisters and parents, in-laws and children whether such relationships are by blood or adoption. Whenever an employee is considering outside employment or any other activity which may present an actual or potential conflict of interest, it is the employee's duty to make a full disclosure of the situation to the Company in advance of engaging in any such outside employment or activity. If you suspect that you have a conflict of interest, or something that others could reasonably perceive as a conflict of interest, you must report it immediately to your supervisor or the CEO. While such situations are not automatically prohibited, they are not desirable and may only be waived by the CEO. Conflicts of interest of our directors, executive officers or other principal officers may only be waived by our Board of Directors or the appropriate committee of our Board of Directors and will be promptly disclosed to the public. For purposes of this Code, the CEO will make the determination whether a company is a "material" supplier, customer, or competitor. If you are uncertain whether a particular company is a material customer, supplier or competitor, please contact the CEO for assistance. As an employee of the Company, you have an obligation to put the interests of the Company ahead of your personal interests and to advance the Company's interests when the opportunity to do so arises. If you discover a business opportunity through the use of corporate property, information or position that is in the Company's line of business, you must first present the business opportunity to the Company before pursuing the opportunity in your individual capacity. No employee may use corporate property, information or his or her position for personal gain, and no employee may compete with the Company either directly or indirectly. The Company requires that you fully disclose to your supervisor the terms and conditions of each business opportunity covered by this Code that you wish to pursue. Your supervisor will contact the CEO and the appropriate management personnel to determine whether the Company wishes to pursue the business opportunity. If the Company waives its right to pursue the business opportunity, which must be authorized by the CEO, you may pursue the business opportunity on the same terms and conditions offered to the Company and consistent with the other ethical guidelines set forth in this Code. Business opportunities available to directors, executive officers and other principal officers may only be waived by our Board of Directors or the appropriate committee of our Board of Directors and will be promptly disclosed to the public. Employees have access to a variety of confidential information while employed at the Company. Confidential information includes all non-public information that might be of use to competitors, or harmful to the company or its customers, if disclosed. Employees have a duty to safeguard all confidential information, except when disclosure is authorized or legally mandated. An employee's obligation to protect confidential information continues after an employee leaves the Company. Unauthorized disclosure of confidential information could cause competitive harm to the Company and could result in legal liability to you and the Company. When discussing or in possession of confidential information, employees should always be aware of their surroundings. Employees should not discuss Company business in the presence of employees or others who do not have a right or need to know. Employees should be particularly careful in public places, including restaurants, airplanes, commuter trains and public pay phones. In appropriate circumstances, disclosure of confidential information may be authorized by the CEO or other Company officers. Any outside requests for Company information should only be handled by authorized persons. Any question or concern regarding whether disclosure of Company information is legally mandated should be promptly referred to the CEO. As a result of the Company's business relationships with customers, suppliers and others, Company employees may also have access to and be entrusted with confidential information of other companies. In these cases, other companies' confidential information must be afforded the same protection as the Company's confidential information. The Company competes vigorously but fairly. All employees are obligated to deal fairly with the Company's customers, suppliers and competitors. Employees will not take unfair advantage of anyone through manipulation, concealment, abuse of privileged information, misrepresentation or any other unfair-dealing practice. Information we supply to customers should be current, accurate, and complete to the best of our knowledge. Employees should never deliberately misrepresent information to customers. Employees should not refuse to sell, service, or maintain products the Company has produced simply because a customer is buying products from another supplier. Customer entertainment should never exceed reasonable and customary business practice. Employees should never provide entertainment or other benefits that could be viewed as an inducement to or a reward for, customer purchase decisions. The Company deals fairly and honestly with its suppliers. This means that our relationships with suppliers are based on price, quality, service and reputation. Employees dealing with suppliers must carefully guard their objectivity. Specifically, no employee should accept or solicit any personal benefit from a supplier or potential supplier that might compromise their objective assessment of the supplier's products and prices. Employees can give or accept promotional items of nominal value or moderately scaled entertainment within the limits of responsible and customary business practice. The Company is committed to free and open competition in the marketplace and throughout all business dealings. Employees must avoid all actions that reasonably could be construed as being anti-competitive, monopolistic or otherwise contrary to laws governing competitive practices in the marketplace, including federal and state antitrust laws. This includes misappropriation and/or misuse of a competitor's confidential information, tampering with a competitor's products or making false statements about the competitor's business and business practices. All employees should protect the Company's assets and ensure their efficient use for legitimate business purposes only. Theft, carelessness and waste have a direct impact on the Company's profitability. The use of the funds or assets of the Company, whether for personal gain or not, for any unlawful or improper purpose is strictly prohibited. Promptly report the actual or suspected theft, damage or misuse of Company property to a supervisor. Use the Company's voicemail, other electronic communication services or written materials for business-related purposes only and in a manner that does not reflect negatively on the Company or its customers. Employees should be aware that Company property includes all data and communications transmitted or received to or by, or contained in, the Company's electronic or telephonic systems or by written media. Employees and other users of this property have no expectation of privacy with respect to these communications and data. To the extent permitted by law, the Company has the ability, and reserves the right, to monitor all electronic and telephonic communication. These communications may also be subject to disclosure to law enforcement or government officials. Accurate and reliable records are crucial to our business. Our records are the basis of our earnings statements, financial reports and other disclosures to the public. In addition, our records are the source of essential data that guides business decision making and strategic planning. Company records include booking information, payroll, timecards, travel and expense reports, e-mails, accounting and financial data, measurement and performance records, electronic data files and all other records maintained in the ordinary course of our business. All Company records must be complete, accurate and reliable in all material respects. There is never a reason to make false or misleading entries. In addition, undisclosed or unrecorded funds, payments or receipts are strictly prohibited. Ask your supervisor if you have any questions. We are a would-be public company and are required to report our financial results and a great deal of financial and other information about our business to the public and the appropriate regulators. We are also subject to various securities laws and regulations. It is our policy to promptly disclose accurate and complete information regarding the Company's business, financial condition and results of operations. Inaccurate, incomplete or untimely reporting will not be tolerated and can severely damage the Company and cause legal liability. The Company's senior financial officers and other employees working in the Finance Department have a special responsibility to ensure that all of our financial disclosures are full, fair, accurate, timely and understandable. Such employees must understand and strictly comply with generally accepted accounting principles as adopted by the Company and all standards, laws and regulations for accounting and financial reporting of transactions, estimates and forecasts. Each employee has an obligation to comply with the laws of the cities, states and countries in which the Company operates. We will not tolerate any activity that violates any laws, rules or regulations applicable to the Company. This includes, without limitation, laws covering commercial bribery and kickbacks, copyrights, trademarks and trade secrets, information privacy, insider trading, illegal political contributions, antitrust prohibitions, foreign corrupt practices, offering or receiving gratuities, environmental hazards, employment discrimination or harassment, occupational health and safety, false or misleading financial information or misuse of corporate assets. You are expected to understand and comply with all laws, rules and regulations that apply to your job position. You are responsible for complying with our Insider Trading policy. If any doubt exists about whether a course of action is lawful, you should seek advice immediately from the CEO. The Company places a high value on its credibility and reputation in the community. What is written or said about the Company in the news media and investment community directly impacts our reputation, positively or negatively. It is our policy to provide timely, accurate and complete information in response to public requests (media, analysts, etc. ), consistent with our obligations to maintain the confidentiality of competitive and proprietary information and to prevent selective disclosure of market-sensitive financial data. To ensure compliance with this policy, all news media or other public requests for information regarding the Company should be directed to the Company's CEO. The CEO will work with you and the appropriate personnel to evaluate and coordinate a response to the request. In connection with its public communications, the Company is required to comply with a rule under the federal securities laws referred to as Regulation FD (which stands for "fair disclosure"). Regulation FD provides that, when we disclose material, nonpublic information about the Company to securities market professionals or stockholders (where it is reasonably foreseeable that the stockholders will trade on the information), we must also disclose the information to the public. "Securities market professionals" generally include analysts, institutional investors and other investment advisors. To ensure compliance with Regulation FD, we have designated the following officials as "Company Spokespersons:"
Only Company Spokespersons are authorized to disclose information about the Company in response to requests from securities market professionals or stockholders. If you receive a request for information from any securities market professionals or stockholders, promptly contact the CFO or CEO and/or CSO to coordinate a response to such request. Company employees who regularly interact with securities market professionals are specifically covered by Regulation FD and have a special responsibility to understand and comply with Regulation FD. Contact the CFO if you have any questions about the scope or application of Regulation FD. 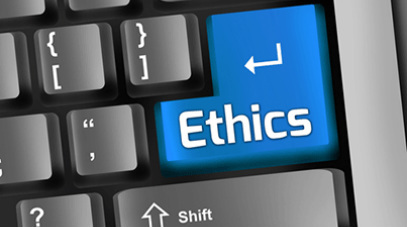 This Code of Business Conduct and Ethics contains general guidelines for conducting the business of the Company consistent with the highest standards of business ethics. If you have any questions about these guidelines, please contact your supervisor, the CFO or CEO. We expect all of Company employees, regardless of their level or location, to adhere to these standards. Each employee is separately responsible for his or her actions. Conduct that violates the law or this Code cannot be justified by claiming that it was ordered by a supervisor or someone in higher management. If you engage in conduct prohibited by the law or this Code, you will be deemed to have acted outside the scope of your employment. Such conduct will subject you to disciplinary action, including possibly termination of employment. Note: This Code and the matters contained herein are neither a contract of employment nor a guarantee of continuing Company policy. We reserve the right to amend, supplement or discontinue this Code and the matters addressed herein, without prior notice, at any time.